Thanks in large to their No. 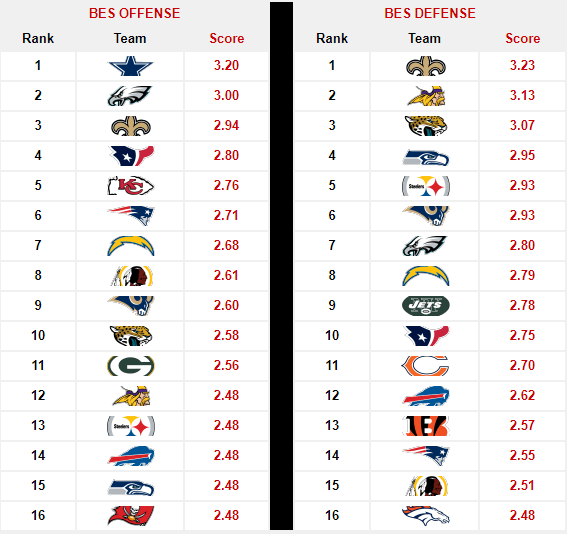 1 BES Defense, the Saints have won their last six games and extend their stay atop the BES Rankings to a third week. 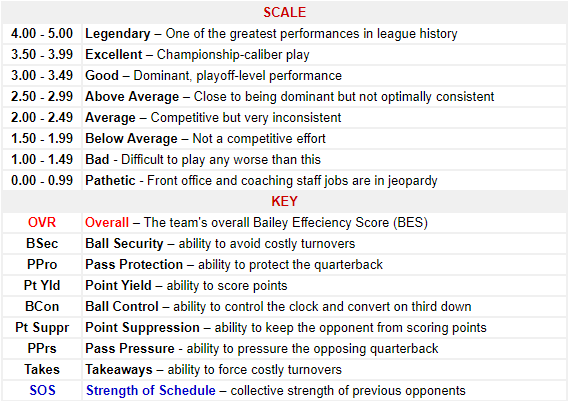 With our Week 9 BES Rankings we introduce a new format to our report. We wanted to streamline our report and make it a little more reader-friendly. Hopefully, you’ll enjoy the new format. Any feedback or suggestions would be greatly appreciated in the comments section. 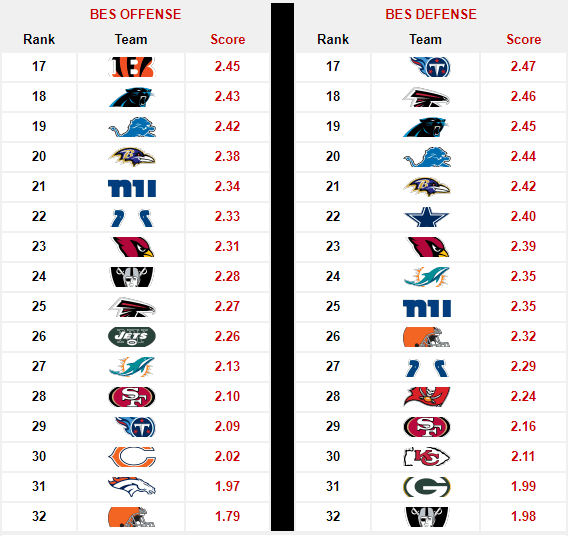 The BES had a rough Week 9, going 7-6 based on our Week 8 data. Our season total now stands at 71-46 (.607). Nevertheless, the BES is 30-11 (.732) in the last three weeks. Saints holding off Eagles – The New Orleans Saints (6-2) own the No. 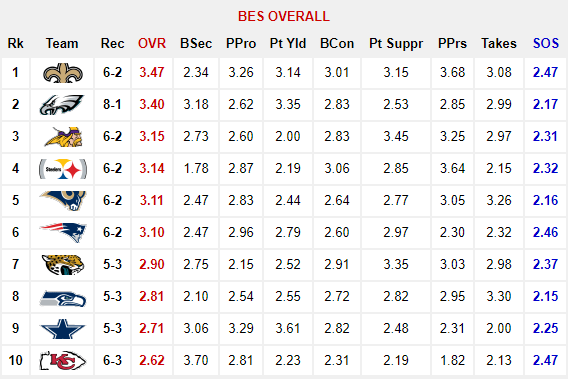 1 spot in the BES for a third consecutive week. However, the Philadelphia Eagles (8-1) are closing in, narrowing the gap to .07 points from .12 in our Week 8 report. The Eagles get a bye in Week 10 while the Saints confront the erratic Buffalo Bills (5-3). Cowboys supplant Chiefs – The Dallas Cowboys continued their steep ascent up our rankings and into the BES Top-10 with a resounding 28-17 win over the Kansas City Chiefs (6-3) in Week 9. The game was a collision of two teams trending in opposite directions. The Chiefs are now 1-3 in their last four contests while the Cowboys are 3-1. 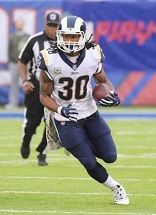 Rams Breach The Top-5 – Occupants of the BES Top-10 for the last three weeks, the Los Angeles Rams (6-2) have finally entered the top-5. They are 5-1 in their last six games, including a current three-game winning streak. Furthermore, they join the Eagles, Saints and Vikings as a quartet of arguably the NFC’s hottest teams. Oakland Raiders (+.32) – This might be a head-scratcher for most. However, consider the Raiders are 2-1 in their last three outings which includes a stunning upset over the Chiefs. Dallas Cowboys(+.22) – As Ezekiel Elliott’s week-to-week availability continues to play out in the courts, he continues to fuel the Cowboys resurgence in the BES. Kansas City Chiefs (-.30) – Not the best way to enter the bye week. 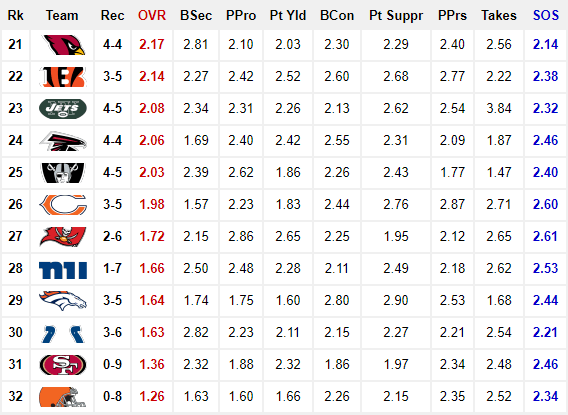 However, one could argue the bye couldn’t have come at a better time for the Chiefs and their 30th ranked BES Defense. Buffalo Bills (-.43) – The Bills are 2-2 in their last four games and fresh off a Week 9 divisional loss to the New York Jets. A big win over the Saints in Week 10 could steer their momentum in the right direction. Vikings (No. 3) @ Redskins (No. 15): The Redskins shocked the Seahawks in Week 9. Could they upset the Vikings as well? Chargers (No. 16) @ Jaguars (No. 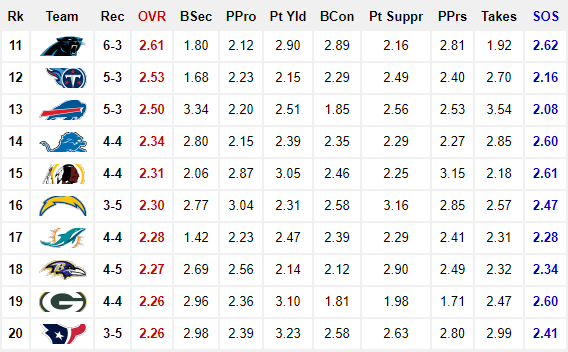 7): Two good defenses plus Melvin Gordon vs. Leonard Fournette (assuming he plays). Expect a physical ballgame. Cowboys (No. 8) @ Falcons (No. 24): The Cowboys can’t afford to look past the Falcons to their Week 11 clash with the Eagles. Saints (No. 1) @ Bills (No. 13): The Bills tend to get up for games like this but the Saints defense is no joke.